Speaker Panel & Networking Event - "Grit to Goal in 2019"
Name: Speaker Panel & Networking Event - "Grit to Goal in 2019"
Grit: Courage and resolve. Perseverance. Resiliency: The strength and speed of our response to adversity. 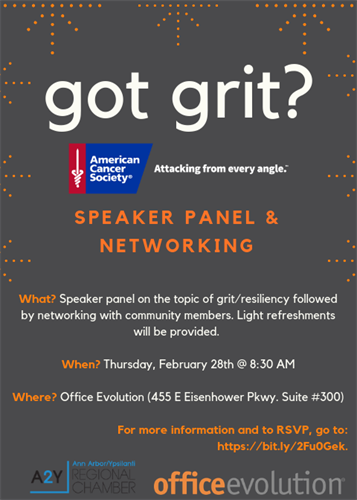 Join us for the American Cancer Society's third "speaker panel series" on the topic of grit and resiliency and how these attributes can help us achieve our personal and professional goals in 2019, co-hosted by Office Evolution and the Ann Arbor / Ypsilanti Regional Chamber on Thursday, February 28th from 8:30 AM - 10:00 AM. Each speaker will have 5 minutes to share their story followed by facilitated questions from the audience and networking with all attendees. Light refreshments will be provided. Coffee will be provided by First Choice Coffee Services. 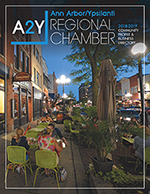 Learn more about our panelists here: Hien Lam (Huck Finch), Emily McGuire (Flourish & Grit), Melissa Joy (Pearl Planning), and Chuck Colby (CADE and Associates Advertising). Please feel free to share this event on social media and with your networks – the more the merrier! To learn more and RSVP to “Grit to Goal in 2019,” please click here. There is no cost to attend, but, please RSVP here.